This article appeared originally in Varangian Voice 37, of November 1995, and has been republished here with minor amendments. It owes its origin to a discussion with Tim Dawson quite some time ago about the composition of the original Varangian Guard, and the extent to which its members would have adopted Byzantine arms and armour. It has always been assumed in the New Varangian Guard that the Varangians in the Empire would have adopted some aspects of the Byzantine and other cultures they met there. The Vikings are well known to have taken on the customs and apparel of the societies they mingled with, whether Frankish (the Normans), Slavic (the Rus), or others. Contact with the splendors and sophistication of Byzantine culture would have been impressive and rather overwhelming. But to what extent would the Varangians have taken on the Byzantine lifestyle and accessories, and how would this influence have shown itself? The Varangian Guard was a close-knit group with high esprit de corps, and both sagas and Byzantine sources suggest that as a relatively small group of ex-patriates they maintained their language, dress and customs to a pretty large degree. The most obvious areas of difference would have been in those material things which they either did not have on arrival, or replaced during their stay. Both the Viking and Anglo-Saxon armies had of a core of highly experienced and well-equipped “professional” warriors, plus a larger group of semi-professionals drawn from the landed class and petty nobility. There is now debate over whether their armies also included the “rabble”; peasant levies with no experience and little equipment. However, a sizable proportion of the figures in contemporary illustrations of warfare, from England at the least, are without armour or helmets, carrying only spear and shield. In the English fyrd system of the 11th century, using Berkshire as a typical example, a shire owed one warrior to the fyrd for each 5 hides, a hide being the amount of land required to support a family, or about 120 acres. There were approximately 70,000 hides in England, which would have produced 14,000 warriors. (McLynn, p.148). McLynn believes that an exhaustive conscription could have produced up to 60,000 (ibid. p.148). On the other hand, Edge & Paddock, (pp 15-16) estimate that England’s total defense force consisted of the following: 3000 in the king’s own huscarls plus another 300 or so for each of the four great earls, 15-20,000 in the “select” fyrd, and the balance from the Great Fyrd, who were peasant levies. If this is true, the great majority of the army would have belonged to the last category, who were ill-armed at best. Even in England, which was a wealthy country, a thegn may not have had a mailshirt, or even a helmet. In 1008, King Ethelred II ordered the production of ships and armour; “ . . . one warship from three hundred and 10 hides, and from 8 hides a helmet and mailcoat” (Anglo-Saxon Chronicle, Peterborough Manuscript). But this may have been intended only for the navy at a time of great military need - it would provide 38 mailshirts and helmets per ship, which would probably equip a major proportion of the crew. Additionally, it appears that this was intended to be a one-off activity, and it is doubtful whether production was continued after the original order was carried out, let alone through the succeeding reigns, down to 1066. The heriot appears to have been a means by which the king supplied his troops, presumably his personal huscarls, with the wherewithal for war. But as a great earl didn’t die every day, there would still not be a great amount of arms and armour available to the king. And what does this say about those lower in the social structure? Even the heriot of a King’s thegn does not include a helmet or mail shirt – is this because they did not have them themselves? If the requirement for an earl was only four helmets and mailshirts each, what does this tell us about the equipment of the average warrior? 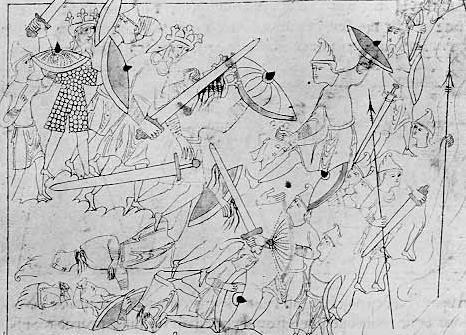 The battle scenes in the Bayeux Tapestry show a large proportion of well-armoured warriors, but most contemporary illustrations are more like the one below, showing an army in which only the king wears a mail-shirt, and nobody has a helmet. If the 6000 Vikings who appear to have founded the Varangian bodyguard of Emperor Basil II circa 988 AD (Blöndal & Benedikz p.43) were of similar proportions to the English army, most of them would have been pretty badly equipped when they got to Miklagard. Even if a higher proportion than usual were “professional” warriors and owned a helmet and armour on arrival, they would still have been a relatively small fraction of the overall number. The same would have been true for those in later contingents. By 1086, over 4000 English thegns had been dispossessed, according to the Domesday Book (Morgan p. 105). Graeme Walker proposes in Varangian Voice 35 (The English Varangians) that post-Conquest Anglo-Saxons of the thegnly class formed a large proportion of the later Varangian Guard. (For further information on this issue, see my article Byzantium: The English Connection. However, as mentioned above, they may still have been relatively poorly equipped. Arms and armour were very expensive, a sword costing as much as 120 oxen or 15 slaves (Edge & Paddock p. 26), and a thegn might own no more than 5 hides of land. (Morgan p. 98-100). As the Emperor’s bodyguard, the Varangian Guards would be expected to have helmet, armour, shield and a good weapon as a bare minimum, and those without them would have been supplied from the Imperial Armoury. And those who had their own gear would have gradually replaced it as equipment broke or wore out. Most would probably have been supplied with basic Byzantine issue. Only their leaders would have been given expensive, decorated equipment. Favorite weapons would have been kept – particularly their two-handed axes; the Varangian Guards were known in Byzantium as the pelekephoroi, or Axe-bearers – and only replaced if they were damaged or lost. In the only contemporary illustrations of the Varangian Guard, from a copy of the Skylitzes Chronicle held in Madrid, they are shown with typical Byzantine helmets and shields, but they have two-handed axes and what appear to be mail corselets, not lamellar. 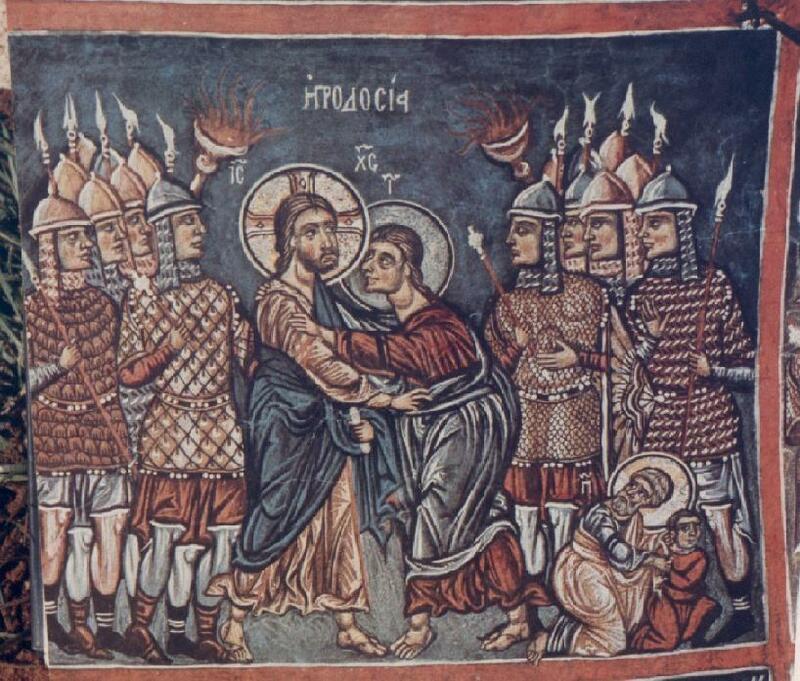 On the other hand, the artist in question routinely puts Byzantine soldiers in the same armour, so there is very little to be concluded from this. “at which every member of the unit is to produce his weapons. Thorbjorn produces the sax which he took from the dead Grettir, and explains the dent in the edge, how it was caused when he struck the dead man on the head with it.” (Blöndal & Benedikz p.203). Shields also do not last long in combat, and anyone who saw action would soon replace his own with a Byzantine one. “At his side he bore his sword Fotbitr [lit. “footbiter”] ; its hilt was inlaid with gold, and so was the blade; he wore a golden helmet and had a red shield at his side on which was drawn a knight in gold (which he had brought from Byzantium); he carried a short sword in his hand, as is common abroad . . .” (Blöndal & Benedikz p.207). “brought with him much money, and many precious things the great lords had given him; he was so nice (i.e. fastidious) in his dress when he came back from his journey that he would wear no clothes except those made of with fine stuff (skarlat) or velvet (pell*), and his weapons were all inlaid with gold . . . all his attendants wore clothes of fine stuff . . . he wore clothes of velvet which the Emperor had given him, and over them a cloak of fine red cloth;” (Blöndal & Benedikz p.206-7). It would be a matter of some prestige to adopt the trappings of such an obviously wealthy and successful society, and something to flaunt when one went home. [By the way, a mis-translation of this passage to mean that the colour of their clothes was scarlet is probably the original of the traditional N.V.G. Red Tunic]. It must be kept in mind that Bolli is described as having been “many years in Byzantium” (Blöndal & Benedikz p.206), and it is likely he would have been heavily influenced by Byzantine lifestyle. Also, though Blöndal and Benedikz believe the account of his magnificence to be exaggerated, it is fairly clear that Bolli had risen fairly high in the Guard (Heath claims he had reached the rank of Manglabites, on the evidence of his “gold-hilted” sword (p.38). On the other hand it is less certain that all, or even most Varangians adopted Byzantine costume. Many of them may have maintained their Scandinavian, English or Russian dress – cosmopolitan Byzantium was accustomed to a great variety of races and clothing styles. However, as the Empire was often hotter than their homeland, the average Varangian might have replaced his woollen garment with others made of lighter Byzantine fabrics – linen, perhaps cotton, and the cheaper grades of silk (the Varangian Guard were very well paid). If he did, his new clothes would probably have been made by a Byzantine tailor, and this influence should also be taken into account. When his boots or shoes wore out, they would have been replaced locally. Tailoring and boot making were becoming specialized trades in the Guard’s period, and there is no reason to suppose they would have made their own clothes or footwear when high quality items were available in the markets. Whether they would have regarded Byzantine fashions as something to be emulated, or dismissed them as effete and decadent, is uncertain. Although Vikings enjoyed displaying their wealth, what appeared luxurious to a Viking barbarian would probably have been sneered at by the Byzantine nobility. In addition, Byzantium had quite strict sumptuary laws, as mentioned in John Sultana’s letter in Varangian Voice No. 34 of February 1995. The Skylitzes Chronicle (fol. 208) shows them in what could be described as “generic” mediaeval outfits, certainly without the gold decorations so fashionable among Byzantines, at least of the upper classes. Crockery wears out or breaks, and is difficult or impossible to repair, so it is likely that it would gradually be replaced with what was available in the City; this would have included not only Byzantine, but also Arab, Persian and Turkish wares. A Varangian would probably have held on to a particularly good table knife or spoon, but quality cutlery would have been widely available in the markets, and he could well have added these to his equipment. Finally, cooking gear would almost certainly be Byzantine. A point made by Tim Dawson is that the Varangian Guard would not have cooked for themselves, as combat units in the Byzantine army were assigned local servants – the Byzantine equivalent of the transport and catering corps – to do such menial tasks. And the Varangians would probably have eaten Byzantine food. Even though they would not have been served gourmet fare as described in Varangian Voice No. 36 (Jeanselme & Oeconomos), the reaction of a Viking accustomed to boiled pork and cabbage, to meals liberally smothered in garum, doesn’t bear thinking about! The assimilation of Byzantine ideas about the world, particularly religion, is problematic. The Anglo-Saxons and the later Vikings were Christians, and though they were Western (Catholic) rite, it is possible that they were influenced by Byzantine ideas on religion. However, given that Orthodox services were conducted in a language foreign to most Varangians, and that the average Western mediaeval man’s Christianity was at best rudimentary and interlarded with superstition, it would be difficult to gauge what influence, if any, Greek thought had on the Vikings who served there. So what does this mean to us as re-enactors? Firstly, if we want to accurately represent the Varangian Guard as they were, we should keep in mind that many of the rank and file would probably have worn Byzantine equipment. (The fact that we don’t accurately know what equipment the Byzantines wore is another matter again). Secondly their dress, tableware and other accessories would have become increasingly influenced by Byzantine and other cultures the longer they stayed in the Empire. With the wider scope adopted by the N.V.G. nowadays, this obviously does not apply to those of us who wish to represent other societies and cultures than the Varangian Guard. However, as long as it is made clear that it is, say, Irish Vikings who are being portrayed, there should be no cause for confusion. The influence of Byzantine thought on the Varangians would be an interesting field for future investigation. The reference material is rather scant, but may bear further inquiry. 6. McLynn, F. 1066 The Year of Three Battles. Jonathan Cape, London 1998.